Comparison of 2 different techniques for anatomic reconstruction of the medial patellofemoral ligament: A prospective randomized study. Kang H, Cao J, Yu D, Zheng Z, and Wang F. Am J Sports Med. 2013; [Epub Ahead of print]. Take Home Message: While both the Y-graft and C-graft effectively stabilized the patellofemoral joint, the patients who received the Y-graft had significantly better subjective outcome scores than the patients who received the C-graft. Patients who endure a patellofemoral dislocation are often plagued with patellofemoral instability and frequent re-injury. While multiple methods of patellar fixation exist, a gold-standard does not. Therefore, Kang and colleagues performed a randomized trial to compare the double-bundle anatomic medial patellofemoral ligament reconstruction with one of two fixation methods – Y-graft or C-graft. The authors randomized 82 patients (40 in Y-graft group, 42 in C-graft group) with chronic patellar dislocations or instability and none of the exclusion criteria: (1) pervious surgery on the injured knee, (2) Q-angle greater than 20° in female patients and 17° in male patients, (3) trochlear angle greater than 145°, (4) tibial tuberosity-trochlear groove distance of ≥20 mm, (5) patella alta, (6) patellar dysplasia (grades IV or V), or (7) full-thickness articular cartilage damage. All patients were examined under anesthesia to confirm the diagnosis of a lateral patellar dislocation. To create the graft, surgeons harvested the tendon of the semitendinosus. The C-graft technique consisted of the folded end of the tendon being fixed to the medial patella and the 2 free ends being anchored into the medial femoral condyle. The Y-graft technique consisted of the 2 forked ends of the graft being fixated on the medial patella and the common end being anchored into the medial femoral condyle. Following the reconstruction all patients, regardless of group, followed the same rehabilitation protocol. 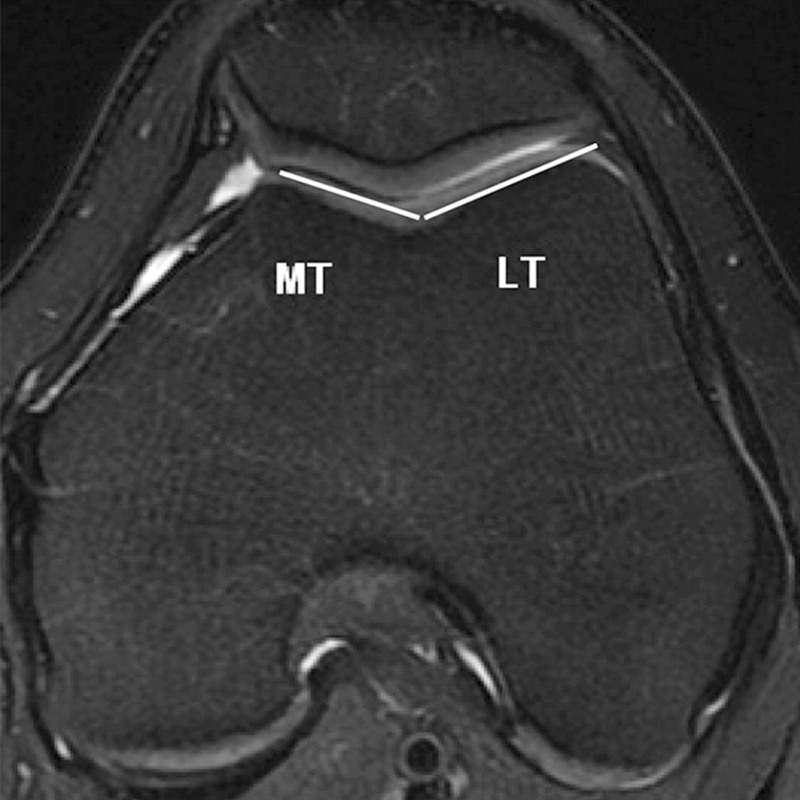 At follow-up (~24 to 32 months post-operative) all patients underwent a patellar stability evaluation (apprehension test used), an axial CT scan at 30° of knee flexion, and completed both the Lysholm and Kujala scores (subjective knee function). Overall, the study demonstrated that at follow-up, both grafts were equally as effective at improving knee stability; however, patients with the Y-graft reported better subjective knee function scores compared with the C-graft group at a minimum of 2-year follow-up. Overall, the authors found that both techniques were beneficial and that patients may report slightly greater function with the Y-graft. Clinicians in the sports medicine team should be aware of best practices with regards to objective measures, patient-reported outcomes, and adverse events (complications). This allows clinicians to communicate all options to the patient to help them make the best, informed decision. In this study, the authors reported no adverse events related to either procedure, similar objective measures, and a slight advantage to the Y-graft in patient-reported outcomes. However, we cannot ignore other important factors such as the patient’s goals and surgeon’s preference/experience. Further, it is important to note that future research should continue to follow these patients to gauge any potentially detrimental effects of the different graft types in the long-term (5, 10, 20, 30 years). Unfortunately, this can add another level of complications since clinical practice often changes faster than long-term data can be acquired. In the end, we must rely on evidence-based medicine but not forget patient preference, clinical experience, and best judgement. Questions for Discussion: Do you and your sports medicine team keep abreast on the gold-standard of treatments, even those treatments that you do not apply? From my experience, adhering to the gold standards of treatment is fairly evident and "obvious" in life threatening situations, such as using an AED, cold water immersion for heat stroke or cervical stabilization with a spine board. Also, there is a lot of familiarity with more common surgical procedures, such as an ACL reconstruction; that is the gold standard for an athlete with an ACL rupture. Personally, I believe it is not as prevalent for clinicians to stay abreast to those gold standards that are not present in their current practice or patient population. This should not serve as an excuse for ignorance to these standards and should drive all clinicians to stay current with research, while maintaining that balance of using clinician judgment and specific to the MPFL surgery mentioned above, the surgeon's opinion as well. Up until a recent conference I attended, I was not as aware of the injuries and potential subsequent surgical procedures associated with the MPFL. Hearing the presentation prompted me to look further into the injury and procedure and this post has served as yet another reminder that as clinicians we should always be reading and exposing our practice to the most current research. We owe this to our patients to be informed and use that knowledge combined with clinical judgment to provide them the best care possible. Great comment, thank you! I think you hit on an issue that we should all be reminded of and that is the need to stay current with the literature with regards to injuries we do not see everyday. I think this gap is where our continuing education conferences (like the one you attended) are key. But in my opinion, this is not a fix all. We as clinicians it falls on us to be aware of this and seek out educational sessions which discuss injuries we are less familiar with. Colby, your example is a great illustration of this. Thanks for the post!